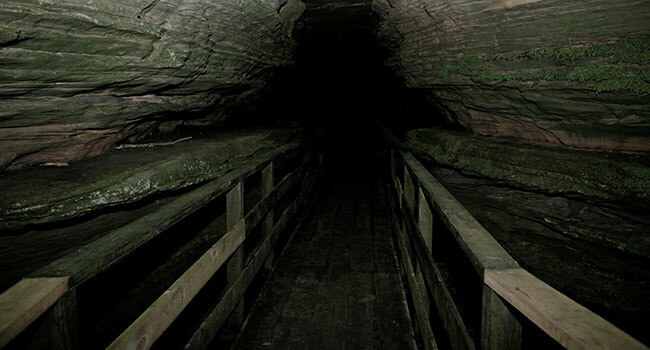 Dells Boat Tours’ spooky after-dark excursion explores hidden canyons in Wisconsin Dells this summer, taking passengers on a frightful journey into the night. Ghost Boat: Journey into Haunted Canyon begins May 22. Wisconsin Dells certainly has its share of dark tourist attractions, from haunted houses, wax museums, Ripley’s Believe it or Not, and, more recently, creepy nighttime tours into the creepy recesses of the Wisconsin River. Ghost Boat: Journey into Haunted Canyon opens this weekend. A spooky adventure on the Wisconsin River at night begins Memorial Day weekend when Ghost Boat: Journey into Haunted Canyon embarks for another summer of scares and chills. The popular excursion begins with an eerie boat ride upriver to Cold Water Canyon where passengers disembark and continue their expedition on foot into the shadowy recesses of the haunted gorge. The summer Ghost Boat runs exclusively to Cold Water Canyon. When darkness falls, the Ghost Boat leaves the safe harbor behind for an ominous 1½-hour adventure into the heart of the Dells. The nocturnal excursion begins with a ghostly tale on board the vessel. The murky waters that flow beneath are an unnerving reminder of the deadly history of this once treacherous waterway. Many river men were swept away as they tried to navigate their rafts of lumber through the swift current. The mysterious stage is set as the Ghost Boat docks along the solemn shores of Cold Water Canyon. Draped in darkness, the canyon beckons to passengers to disembark and walk into the gorge on foot to find out what lies in wait. The narrow pathway at times requires a single-file approach as rocky cliffs hug you and an abyss of darkness adds to a truly intense adventure.